35006001 EX1200-6 HITACHI EX1200-6 Crawler excavator. Spare Parts Catalog. Service (workshop) Manual. Operator's Instruction Manual. 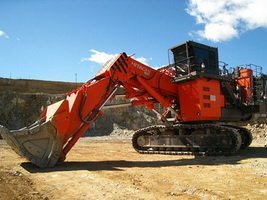 35006002 EX1900-6 HITACHI EX1900-6 Crawler excavator. Spare Parts Catalog. Service (workshop) Manual. Operator's Instruction Manual. 35006003 EX2500-6 HITACHI EX2500-6 Crawler excavator. Spare Parts Catalog. Service (workshop) Manual. Operator's Instruction Manual. 35006004 EX3600E-6 HITACHI EX3600E-6 Crawler excavator. Spare Parts Catalog. Service (workshop) Manual. Operator's Instruction Manual. 35006005 EX3600-6 HITACHI EX3600-6 Crawler excavator. Spare Parts Catalog. Service (workshop) Manual. Operator's Instruction Manual. 35006006 EX5500E-6 HITACHI EX5500E-6 Crawler excavator. Spare Parts Catalog. Service (workshop) Manual. Operator's Instruction Manual. 35006007 EX5500-6 HITACHI EX5500-6 Crawler excavator. Spare Parts Catalog. Service (workshop) Manual. Operator's Instruction Manual. 35006008 EX8000-6 HITACHI EX8000-6 Crawler excavator. Spare Parts Catalog. Service (workshop) Manual. Operator's Instruction Manual.